Last vistors enter half-hour befor closing. 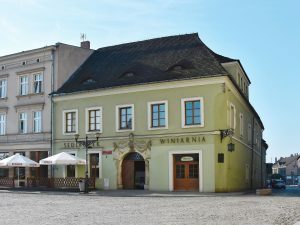 In 2019, the Museum in Tarnowskie Góry is closed to visitors on Mondays and on the following days: January 1 and 6, April 20 and 21, May 1 and 3, June 9 and 20, August 15, November 1 and 11, December 24 and 25. In addition, the Museum reserves the right to change the date of sightseeing and the temporary closing of exhibitions. Additional service: Fee for guided tours in English: PLN 50 per group (booking: muzeum@muzeumtg.art.pl). The Museum in Tarnowskie Góry was founded in 1958. Its seat is located in a 16th c. tenement house at Rynek (Market Square). Building’s facade is decorated by a stone portal and a 18th c. stucco decoration with puttos holding a curtain, a coat of arms and a knight’s helmet with a plume. On the quoin below the roof – a stone head with a plume. The interior of the tenement house has also artistic values. On the first floor exhibition rooms, i.a. : the Renaissance room with a unique richly ornamented polychromed ceiling from the 16th c. and the Baroque room with a floral molding on the ceiling from the 1st half of the 18th century. The room with richly ornamented polychromed wooden ceiling from the 16th c., discovered during repairs in 1956. The interior equipped with Renaissance or Neo-Renaissance furniture and court chests from the 18th c. is a reference to the original design of the room. Especially Italian chest from the 16th c. and inlaid chairs and bench draw attention. The most valuable collection is presented here – Western painting from the Italian, the Dutch and the Flemish School (16th–18th c.). Among others should be mentioned. : unique, made from Limoges enamel ”The Birth of Christ” from the 16th century by Martin Didier, ”The Temptation of St. Anthony” from 1645 to 1650 by David Teniers II or the portrait of doctor Hendrik van Deventer from 1703 by Thomas van der Wilt. The exhibition is presented in three rooms. 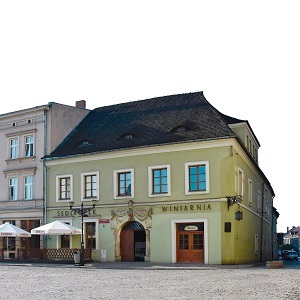 In the first one there are objects from the beginnings of settlement and the birth of the town, connected with ore mining, metallurgy, municipial authorities, the Henckel von Donnersmarck family, enterprises in Tarnowskie Góry, ”Sedlaczek” winery and also a collection of tin vessels. The second room exhibits railway transport in Tarnowskie Góry and souvenirs from various social and cultural organizations. The last room starts with a collection of masonic items accompanied by a multimedia show. The room is also a reference to multiculturality of the town, where Catholics, Lutherans and Jews were living next to each other. The exhibition ends with souvenirs from the Silesian Uprisings, the Plebiscite and a broadly defined military history. The exhibition is a reference to an important event in the history of the town – the visit of Jan III Sobieski in Tarnowskie Góry (August 20–22, 1683) during his journey to the Battle of Vienna. It shows many interesting items commemorating the victor of the battle – paintings, graphics, medals, sculptures, fragments of hussar armour, arms or elements of Sarmatian clothing. They are the biggest collection of such type in Upper Silesia. The exhibition is accompanied by a multimedia animation which introduces the atmosphere of the second half of the 17th c., the times of Sobieski, the expedition of the Polish king to Vienna, the war with Turkey and especially the Battle of Vienna itself.